Enjoy this glass of wellness; the refreshing and mindful blend of flowers, herbs and plants, embracing the raw touch of nature as it is. In pursuit of the perfect 25th anniversary cocktail that embodies Banyan Tree Group, we held a contest – our 1st Group-wide Initiative. Banyan Tree Phuket’s bartender, Khun Kornchaphat Pichayadechapaisarn won the hearts of the judges with his creation - The Botanical. This cocktail encapsulates our practice of putting wellness first and reflects the longevity and identity of the Group – green, elegant and refined. The Botanical features an array of flowers, herbs and plants as the key elements of the cocktail. Made of gin, midori, homemade kaffir syrup and fresh lime, this cocktail is a refreshing and invigorating drink at the same time. It comes with a foam that is made of fresh dill, peppermint tea, kaffir syrup and egg white. 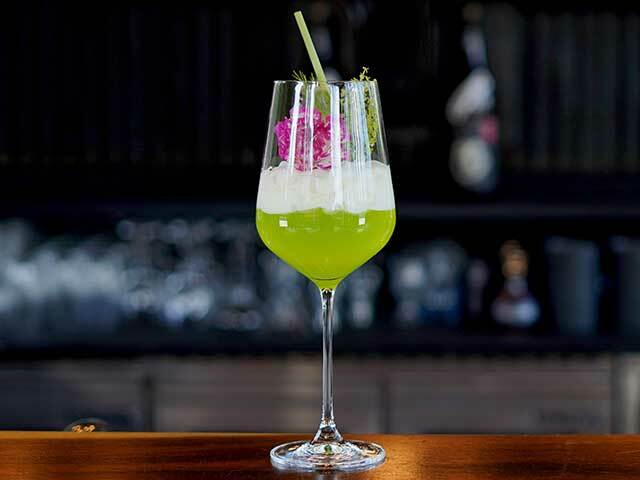 Each glass is topped with fresh basil flowers, ice balls, edible carnation flowers and an eco-friendly lemongrass straw. Enjoy this as a complementary drink when you book the 25th Anniversary package or order it at the hotel’s restaurant.